Where it’s become interesting for me (and for many of my readers too, I suspect), is the way the discussion has spilled over into the area of literature in translation. And Other Stories founder Stefan Tobler has become the first person to meet the challenge, pledging to have an all-female list for 2018. I’d say that there’s a fair chance that other (small) publishers will soon follow suit, so the move towards a year of female-written books might not be quite as far-fetched as it first appeared. Personally, I’m not convinced that it’s a great idea – a year is a long time, and while the idea is meant to overturn perceived discrimination, in itself it’s inherently discriminatory. It’s also unrealistic to expect the big boys to play along; the majors will publish what they think will sell, and if that’s more men, then that’s what we’ll get. In fact, not everyone agrees there is an imbalance, anyway (see the reply of Hannah Westland from Serpent’s Tail for another view on the topic). However, while we might debate the matter in terms of publishing in general, fiction in translation definitely does have a gender imbalance, and it all starts with what gets published. Even a casual glance at the latest Three Percent figures for 2015 (earlier in the week – more books have been added since…) show this. A very quick, unscientific poll I did showed that around 45 of the 167 books recorded for the year were by women, a result which is close to the standard quoted figures. There are a number of people on the case, trying to rectify this imbalance. Katy Derbyshire, translator and curator of the love german books blog, has been going through statistics and dreaming up plans for a prize for female-written literature in translation. 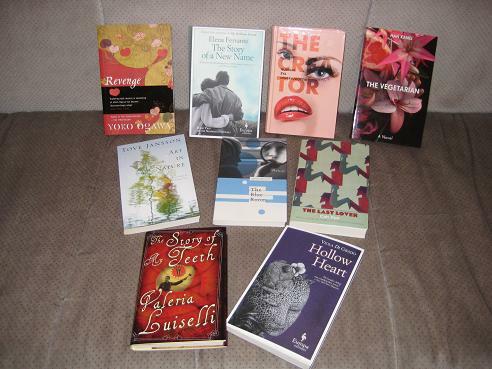 Biblibio’s Meytal Radzinski introduced a Women in Translation Month to the blogosphere in August last year, and there’s another one planned for later this year. There are plenty of ground roots efforts to increase the gender balance in translated fiction, then – but is that enough? So, what should we be doing? As I mentioned above, while some publishers might rally to the cause, most won’t. In addition, as many have rightly argued, preferencing women risks neglecting other so-called ‘minorities’ (e.g. LGBT, people of colour). For me, a year of publishing women sends the wrong message – a month, on the other hand, why not? Thanks for a thoughtful addition to this discussion. I have been unable to address it without a level of frustration given my somewhat unique perspective on life on both sides of the gender divide. Unfairly clearing the playing field for a defined time is not a long term solution. Really interesting post and thoughtfully argued. Anything that encourages more people to read or publish any translated fiction – whoever wrote it and wherever in the world they are from – is a good thing, but reading books only by female writers for that length of time isn’t something I personally would ever want to do as I value the freedom of choosing what I read. It will be interesting to see what And Other Stories publish in 2018 though. I doubt that And Other Stories’ decision is going to make a huge difference overall; but to my mind it’s analogous to Peirene’s grouping their books by theme – it’s just having a partiuclar focus for a period of time. That said, I do admire AOS for sticking their neck out – no doubt there is an element of calculation in their decision (as you said on Twitter, it’s good publicity), but to me it reflects the kind of conviction that lies behind their publishing. I agree with you that the best thing we can do as readers and bloggers is to talk about the good existing stuff – provide a map and (hopefully) others will begin to explore. David – Ah, but there’s a big difference between three books by women and 10-12! As mentioned above, it may be just as much about redressing the balance of the past as it is about anything else. I think one important point that has largely been overlooked in the discussion is that a year of publishing women and a year of reading only women are not the same thing. Most people don’t read only brand new books in a year and so no-one would be limited to reading only female authored works should they choose otherwise. What it does do is give the publishing houses the opportunity to look hard at their selection processes and submissions and use the time to discover firstly whether there truly is an imbalance, and secondly where it is coming from – is it a question of number of submissions, or of selection bias? Or are the novels being produced by women just not as good as those produced by men? I think that uncovering answers to these questions is a useful step. Of course there are worries about it distracting from other groups who perhaps at this stage need the attention more urgently, but men certainly don’t need to worry that one year of a few small publishers publishing only women is going to discriminate against them. And in terms of AOS’s output, is 10-12 books by women really so many that people find it hard to handle? For those of us who read voraciously, that’s a fraction of what we read in a year. Audrey – I think that’s a false argument – I’m certainly not against AOS having a year of women writers, and I doubt anyone else is either. It’s the basic principle of the whole publishing industry discriminating against men for a year that’s up for discussion (and *that* is what Shamsie is suggesting). If this really were to go ahead (and, let’s face it, it won’t), it would be a catastrophe (and possibly illegal in some places). Judging from comments left in less open minded corners of the internet, a lot of people are very strongly against AOS having a year of women writers. It’s been horrifying to me to read just how strongly. I personally believe in positive discrimination as a method for rectifying institutionalised discrimination across a variety of scenarios, and I think it is a widely misunderstood practice that puts people’s hackles up quickly. I’m not sure that I understand why you think it would be a catastrophe if it did happen, but that’s really an academic issue as we all agree that it isn’t going to. In the end the important thing is that it has provoked us all into having these conversations, and many people – not just publishers – are now looking at the diversity of the books they read. It’s interesting to me in part because it was when I started focusing on the lack of diversity in my reading that I stumbled into translated fiction, and now it has come full circle. Yes, I went below the line and regretted it immensely about 30 seconds later. Positive discrimination is a tricky one, I won’t deny that, and my take on it has been strongly informed by growing up in South Africa where it still is an important but controversial part of the national framework. That’s a whole other kettle of fish though, and as you say not something we’re going to change each other’s minds on here. Anyway, that’s my 2 cents, I’ll back out before I colonise your comments thread! Thank you for engaging on it! I’ve been a bit torn about this, as it does feel like discrimination and tokenism. I think campaigns like #readwomen are more useful, as it increases the demand for female authors (one would hope). A very thoughtful, balanced contribution to a discussion that has become rather shrill at times.